Minneapolis is sitting high in the saddle at the top of the list of most bike-friendly cities in the country. With mass transit bike racks, Nice Ride and a robust and ever-growing network trails, lanes and bike-share programs– the city has over 220 miles of bike lanes and off street trails, with more in the works— Minneapolis’ gold star status as a cyclist’s delight is part of the quality of life that makes living, working and playing here so rewarding. Here are some insights from KA employees and business associates about cycling in the city. 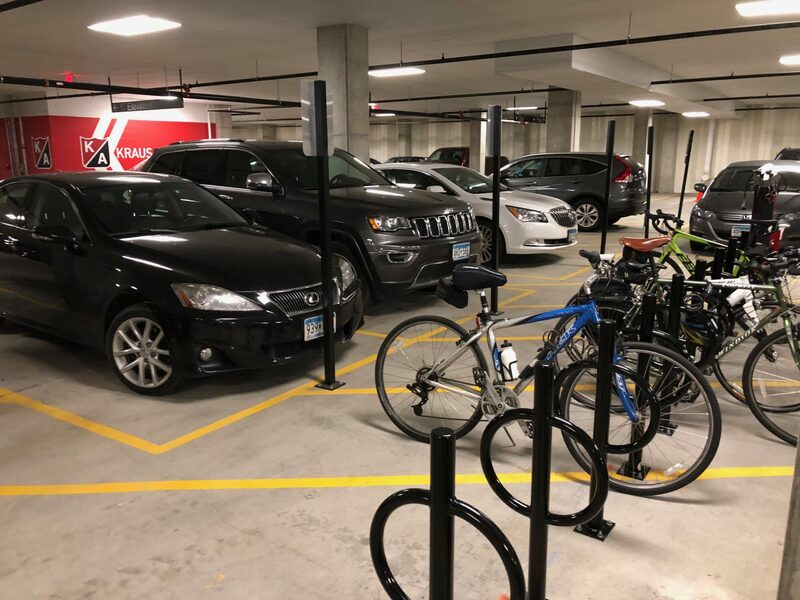 Moving back downtown into a new building with underground parking, lockers, showers and now, bike racks, has been just the nudge some of us needed to get pedaling. 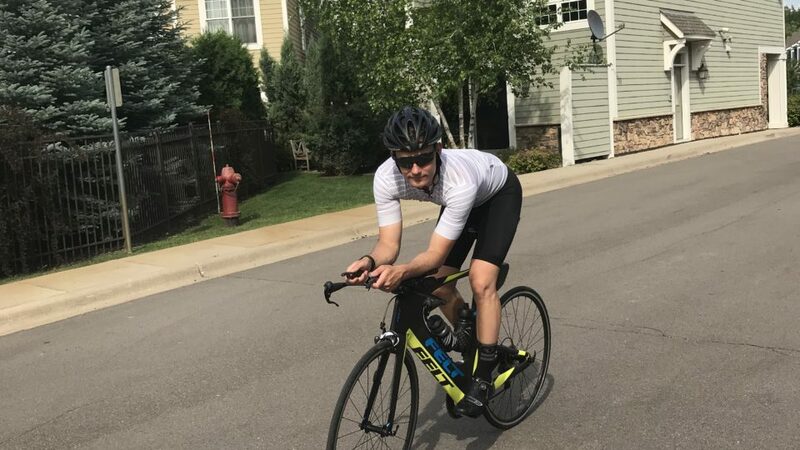 “Once we were in the new office and warm weather arrived, I’d been meaning to start commuting, but had too many excuses,” recalls Mike Benz, Kraus-Anderson VP of Information Technology. “I had been taking the express bus four days a week and driving one day, if I had an offsite meeting. Once the 35W downtown exits closed in early June, my 20 minute bus ride turned into 40 and my 30 minute car ride turned into an hour.” Cycling to work, “takes me 30 minutes door to door, plus time to lock up the bike, shower and get dressed. Still quicker than the car,” Benz said. You don’t need to live downtown to enjoy cycling here, moreover. During the fair weather months, KA Construction President/COO Al Gerhardt commutes by bike 30 miles round trip two or three days a week when the weather cooperates. “I arrive at the office before 6:15 AM, so traffic is not an issue then. In the evening I go south on Portland to the Midtown Greenway and then head west to Minnetonka,” he says. 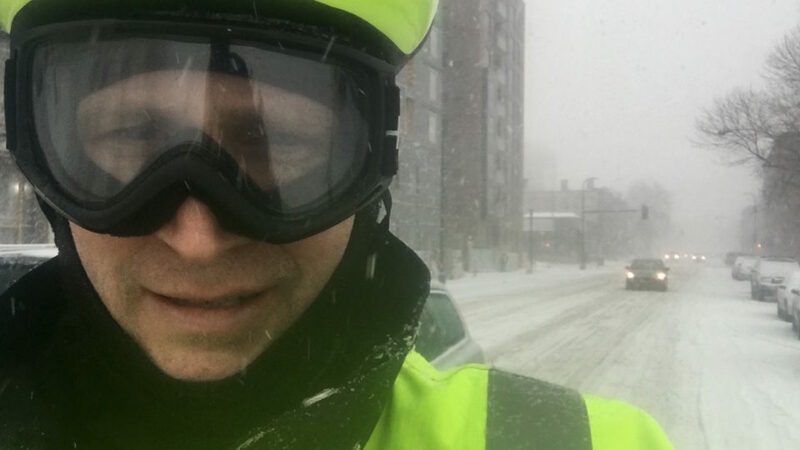 Layers, metal studs, helmet and tail lights, fenders and panniers are all part of the vocabulary for Dan Collison, another all-season cyclist in Minneapolis. The cycling habit sort of crept up on him, contends Collison, who includes a bike helmet among the many hats he wears as Director of Downtown Partnerships at MDC-DID, Executive Director of East Town Business Partnership and 2020 Partners, and Lead Pastor at First Covenant Church. Frustrated with traffic, in 2010 He started experimenting with cycling to his numerous daily appointments, and through trial and error, little by little honed his knowledge of best routes, bus routes, scenic routes, short cuts, pothole hazards, and all-weather gear to become a dedicated year-round rider. “Being aware is the best safety advice I can give to my fellow riders. I am always trying to think one step ahead and anticipate my reaction if a motorist gets too close,” advises Benz. “Increasing my visibility by wearing reflective clothing, bright lights and a helmet makes me feel a lot more comfortable,” says Williams. “I’ve had two incidents where a helmet saved my skull,” says Collison. Minneapolis cyclists are sharing the roads this summer with other two-wheeled vehicles: rentable motorized scooters landed this summer at “virtual stations” throughout the streets of the city; and people are flocking to them. Whether they’re here to stay, or just a cycle, there’s always more than one way to get around town in Minneapolis. Check out the Greenway Glow event Saturday, July 28 starting at 6:00 p.m. Join other Midtown Greenway riders for a free art festival and an organized ride down the Greenway (registration is required for a ride). Who knew? Nice article, Laurisa!